Academics and students at Birmingham City University have joined forces to come up with a guide on hydration and food tips to support Muslims who are fasting for the month of Ramadan. The month of Ramadan begins on May 17 and will see a large number of Muslims across the world observing a month of fasting during daylight hours, which is one of the Five Pillars of Islam. The month teaches observers self-discipline and awareness of those living in poverty. Those fasting cannot eat or drink during daylight hours until the sun sets and cannot even drink water. When fasting, we often don’t think about how to make small steps to better impact our body functions and vital systems during the day. Hunger and starvation makes our bodies crave things that may not necessarily feed our systems in a good way when the time comes to eat and drink again. Experts at Birmingham City University have joined forces to develop a guide on what to eat and drink, and how to balance a good routine to support your wellbeing throughout Ramadan. For the pre-dawn meal, more commonly known as Suhur, experts recommend eating foods that will provide the body with enough energy to last a good few hours. It’s important to focus on slow-digesting foods like high protein and high fibre. Some great examples of these are oats and whole wheat foods like barley, brown rice, buckwheat and whole wheat bread or pasta. During Ramadan, people who are fasting cannot drink anything at all, not even water. 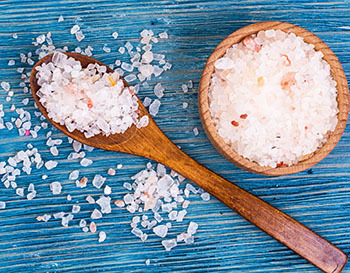 When preparing meals for Suhur, it is really important to make sure you avoid having too much salt because this makes you thirsty throughout the day. On days where the temperatures are high, this is definitely something you want to avoid. During the hours before dawn, it’s also crucial to get enough liquids in your system before heading back to bed. If you sleep before Suhur, your body will be slightly dehydrated after sleep, so make sure you drink as much water as you can pre-sunrise. Drinking water will flush out toxins before a meal, and boost your energy for the day ahead. For all the tea and coffee lovers out there, caffeinated drinks contain water, so can contribute to your daily fluid intake, but be aware that they have diuretic effect. This means that it can increase your body’s production of urine, which can lead to dehydration. Tea and coffee also contain tannin, a chemical that blocks the pores of cells and can cause dry skin. So limit your tea and coffee and drink more water instead. Iftaar is the name given to the post-dusk meal, and is specifically timed each day to the exact minute that the sun sets. Drink as much water as you can once the time comes to eat and drink again. Your body craves liquid nourishment more than solid foods so use this time to make sure you have at least two litres of water during night-time hours. 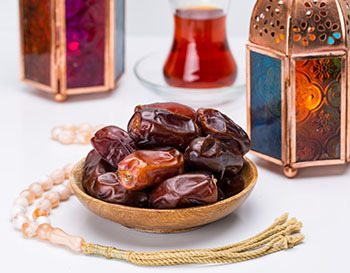 It is traditional for Muslims to open their Fast with a Date, which has scientific benefits. Energy-rich foods with natural sugars are a great way to provide fast-releasing energy to the system. Things like raw fruit, particularly dates and even fruit juices, are perfect for this. When it comes to meals it is really important that they comprise of a good balance of starchy carbohydrates, like potatoes, rice and bread, along with a good intake of vegetables, proteins such as meat or fish, and dairy for the natural fats. 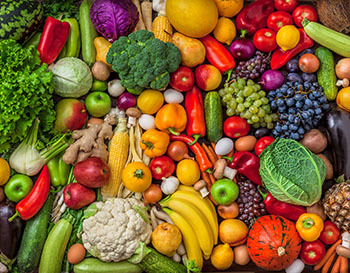 There is only a small window to provide your body with all the key nutrients that the body needs, so the focus of diet during Ramadan needs to be on quality. Though the temptation may be great at times, when the time to eat comes around each day, it’s important to avoid high quantities of processed foods and those with added sugars because they have a relatively low nutrient density. This means that you won’t be feeding your system enough nutrients. Opt for complex carbohydrates such as oats, rye, barley, brown rice, quinoa, berries, apples and oranges, which have a low glycemic index and do not spike blood sugars. Fasting and keeping fit can go hand in hand. One common question that gets asked is if you can work out or exercise during Ramadan. The answer is yes but you have to plan it accordingly. It’s vital to remember that your body won’t have the same amount of energy that you would have on a normal day. As at any other time, people should try to maintain active lifestyles where possible. Try to do light exercise like walking and meditative exercises in any spare time you have; this can help to keep the system working and blood circulating. Step outside, cycle, play a game, go to the gym for a light workout session, or do some gardening. Even helping out in the kitchen would be better than just sitting down and waiting for the Iftaar time, or at least do something that keeps you moving and that you enjoy. Cardiovascular exercises like walking and cycling, full body stretching and mat exercises are great at helping to burn calories and improve stamina. 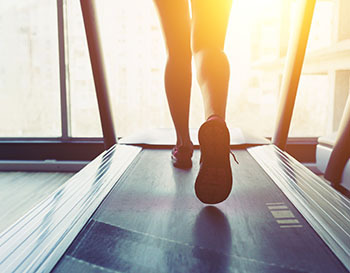 Avoid high intensity exercises like sprinting or heavy lifting as this could cause injury and lead to dizziness and low blood pressure, and you could end up feeling weak or sick. If you exercise within eating times, make sure you have allowed enough time for food to be digested before you exercise and that you drink plenty of water during Iftaar and Suhur times. Keep workouts short to between 30-60 minutes. Swap the deep fried food such as pakoras and samosas for healthier alternatives like having them baked and using less whole spices. Similarly with sugary goods like doughnuts, ice cream and cakes, you can swap them with things like fruit salads and yoghurts. Avoid cooking methods like frying and deep frying and swap it for methods like baking or grilling and even light frying. For curries it is useful to cook with a larger base of tomatoes and onions and less oil. Make your lunch breaks productive. You know you have a lunch break but you can’t eat or drink anything. Avoid working through your lunch and do things like go out for a walk and get some fresh air, take prayer breaks, or take a nap. Make a daily to-do list and write down what you’re finding challenging, and plan what to do to combat these challenges efficiently. There’s nothing wrong with planning a few breaks in your day. Taking regular breaks increases productivity at Ramadan or any other time of the year. 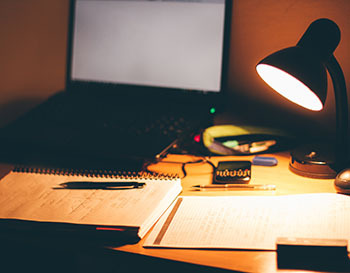 Plan your day and add a few breaks into your working day which will help you reduce stress, refresh your attention, and reduce the risk of on-job accidents, and keep you focused and on schedule. In turn, this will increase productivity as well as keeping you fresh throughout the day. You can also try multivitamins, which are great for giving your body all the necessary nutrients. You can take multivitamins during Iftaar or Suhur, but just make sure it contains 1,000 IU of vitamin D and at least 500mg of omega-3s. Do not skip the Suhur meal. Some people do this to keep up with sleep but you will need the energy from this meal to help you throughout the day. Eat your food slowly during the times that you can eat and drink. This makes the energy of the food release a bit slower in your system so you’re energised for longer. The guide was put together by Dr Huda Al-Kateb, Dr Matt Cole and Ayaz Safi from the Faculty of Health, Education and Life Sciences and should not be interpreted as official University policy.